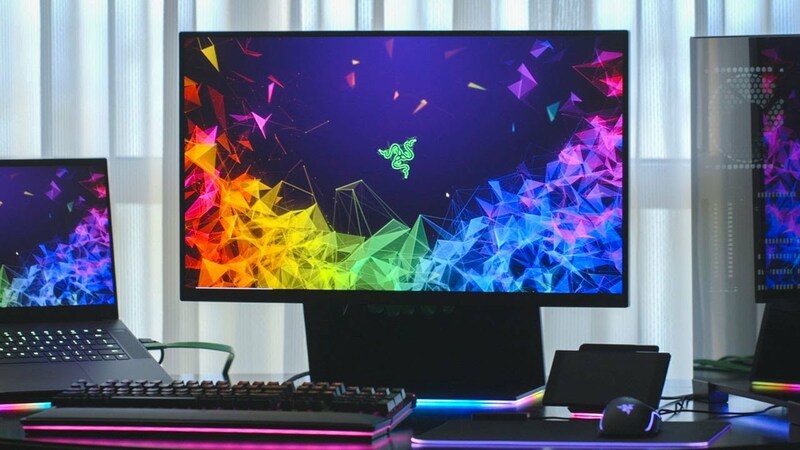 CES 2019 - Razer has just dipped its toes into the gaming monitor market with its unveiling of the Razer Raptor, a new 27-inch gaming display with one of the most unique designs for a gaming monitor I've ever seen, and I hope Razer keeps it in the final version. First off, we'll get the tech specs out of the way: the Razer Raptor has a 27-inch IPS panel with a native resolution of 2560x1440 and 144Hz refresh rate with FreeSync and HDR support. With 1ms response rate with Motion Blur reduction enabled, 4ms with overdrive, and 7ms typical response rate. We have HDMI 2.0, DisplayPort 1.4, and a bunch of USB connectors. But it's the back design of the Razer Raptor that has caught my attention, with some awesome design work by the Razer team on the integrated cable management system and slide-up-and-down for screen height adjustment. The iconic black/green theme is throughout, while the base has a gorgeous fabric/metal backplate and Chrome-capable RGB lighting of course. Razer will also have some impressive picture-in-picture features that will let you see multiple inputs at once, with the company including screen mirroring support for its Razer Phone 2 smartphone through USB-C, which will let you use your smartphone with a full screen (in this case 27 inches) with mouse and keyboard support. Razer will reportedly be selling its new Raptor gaming display for $700 according to Hardware Canucks.